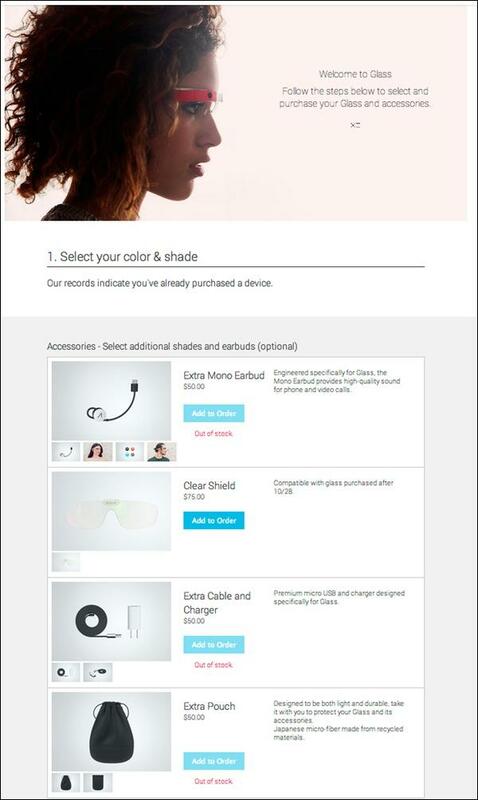 The Google Glass project is certainly coming on apace, with the Mountain View company on Wednesday launching an online store for accessories. Currently open only to those on its Explorer testing program (via the My Glass control panel), the new store offers, for example, the mono earbud we first saw yesterday with the announcement of a Glass hardware update. The earbud, which Google promises “provides high-quality sound for phone and video calls”, comes with an equally high-quality price tag of $50. You’ll find a cable and charger too, also for $50, and a clear shield for a hefty $75. A “light and durable” pouch for the face-based computer is also available, but like everything else in the store, its price will probably cause your wallet to wince ($50). When Glass hits the market, possibly early next year, it’ll come with an earbud, cable and charger in the box, so you’ll only need to raid the bank if you lose or break one of these items. If you want the shield, however, that’s $75 you won’t be able to avoid paying, though if you’re an industrial welder who likes to keep up to date with the latest sports scores, it should be money well spent. You’ll also find in the Glass box a shade, designed in collaboration with Hawaii-based Maui Jim Sunglasses and eyewear maker Zeal Optics. It’s not currently showing in the accessory store, though when it does turn up you can be certain its price tag won’t look out of place alongside the others. A new support page for Glass describes in detail how to attach a shade or shield, a process which involves lots of tilting, a fair bit of sliding, and a black cushion. So there you have it. A new online store for Glass accessories. Some pricey prices. And a massive barge in San Francisco Bay.